Crisp, fall air will soon be setting in to remind you that it’s almost time to break out your winter gear. Being out in harsh winter weather conditions is tough, and no one knows that better than your house. That’s why, in addition to dragging your snowboots down from the attic, homeowners should also make sure their house is winter-ready. Autumn is the perfect time to give your home’s exterior a once over, says Vicki Payne, a nationally recognized home improvement expert. Payne recommends getting everything on your house checked and cleaned up prior to the start of winter. Not sure where to start? Let Payne’s checklist guide you on your way to having a house that is well-prepared to handle even the snowiest winter days. Evaluate your roof. Your roof will handle the brunt of the elements, so it’s important to make sure there are no missing or loose shingles. Asphalt shingles should be checked for mold or algae, and wood shingles should be checked for split wood. Clean your gutters. Functional gutters are key to ensuring your home won’t be defeated by winter weather. In addition to cleaning out leaves and gunk, homeowners should make sure gutters are securely attached to the home and sloped for proper drainage. Check your siding and trim. There shouldn’t be any rotting boards or insect infestations in your wood exterior. If your siding or trim needs improvement, consider researching low-maintenance exterior covering options, such as fiber cement siding or PVC trim. Examine your deck. If summer has left your deck looking a little haggard, consider replacing it using material that can stand up to winter weather. Payne recommends Western Red Cedar or composite decking from TAMKO. Check your garage door. Your garage door helps keep cold weather out and energy bills down, so it’s important to make sure it’s functioning well. Should it need an upgrade, consider going with a steel or aluminum garage door. Seal up windows. To keep cold weather from sneaking into your home, make sure your windows have strong weather stripping and energy-efficient glass. Check your doors. Door openings should also be equipped with weather stripping to help stop drafts. Spend time landscaping. Fall will inevitably leave behind a blanket of crunchy leaves. 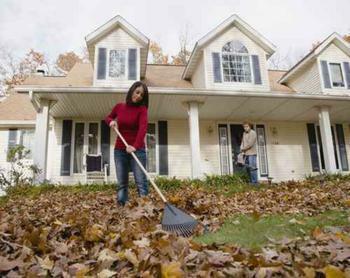 Make sure to rake and remove dead leaves and underbrush before the first snowfall.